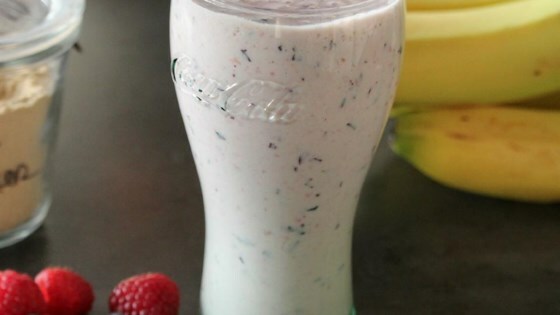 "I created this smoothie to keep me going in the morning and prepare for heavy workouts. It's high in good fat and antioxidants and will actually fill you up through the morning. It is also dairy-free." Blend almond milk, blackberries, blueberries, coconut butter, honey, and chia seeds in a NutriBullet(R) or blender until smooth and creamy. If you would prefer a dairy-filled smoothie or don't want the extra fat, then don't add the chia seeds and coconut butter. Replace the almond milk with 1/2 cup of your favorite plain yogurt and 1/2 cup of orange juice. The chia seeds made it so thick you had to use a spoon so it wasn't like a smoothie but a pudding. Throw in a handful of frozen kale - you'll never taste it and it will up the nutrients! Quite delicious. I used raspberries instead of blackberries. Thank you for the recipe.